Foxnews is carrying an article on a dust-up over body armor within the Corps. The Pentagon and Marine Corps authorized the purchase of 84,000 bulletproof vests in 2006 that not only are too heavy but are so impractical that some U.S. Marines are asking for their old vests back so they can remain agile enough to fight. Marine Commandant Gen. James Conway wants to know who authorized the costly purchase of the nearly 30-pound flak jackets and has ordered the Marine procurement officers at the Quantico base in Virginia to halt the rest of an unfilled order, FOX News has learned. “I’m not quite sure how we got to where we are, but what I do know is it is not a winner,” Conway told FOX News at the end of his recent trip to Iraq. Twenty-four thousand more vests were scheduled to be shipped to Iraq in the coming months, but Conway halted that order during his trip. “I’ve asked them to tell me — to walk me through — the whole process … how it evolved,” Conway said. The protective jackets, manufactured by Protective Products International in Sunrise, Fla., are known as Modular Tactical Vests, or MTVs. With heavy plates, known as sappis, on their sides, they provide more coverage than the older vests. That makes them much safer but also much heavier. The MTVs have more protection than the older “Interceptor,” made by Point Blank, and they distribute weight more evenly. The new vests, weighing in at about 30 pounds each, are three lbs. more than previous regulation body armor. Marines, who are already carrying up to 95 lbs. depending on the mission, say they feel the difference. It is frankly difficult to imagine that this issue could have become so confused to so many people. Hopefully this article will be enlightening for the careful reader. To begin with, it is necessary to show a picture of a Marine in Fallujah during Operation Alljah, wearing the IBA (Interceptor). This picture comes to you courtesy of Bill Ardolino who embedded with the 2/6 Marines in 2007. Take particular note of the thing hanging on the side of this Marine’s IBA (Interceptor Body Armor) vest. It is called a side SAPI plate (small arms protective insert, or the enhanced version is ESAPI). The side SAPIs are not used when Marines train stateside. They are issued upon entry to the theater. They are issued to the Marine whether he has the IBA or MTV (Modular Tactical Vest). The 2/6 Marines were told that they would be issued the MTV prior to deployment, but delays made that impossible. To compensate, many of the Marines went to TAG (Tactical Applications Group) in Jacksonville, N.C., right at Camp Lejeune, and purchased their own tactical vest, the Spartan 2, which is the commercially available version of the MTV. This Marine didn’t get his before TAG ran out of the vests, so he took his IBA vest. When 2/6 deployed to Iraq, they deployed with the vest, the front and rear SAPI plates, and the soft ballistic panels. Some Marines from 2/6 deployed with their IBA, and had to have TAG send their back-ordered Spartan 2 to their home, and have their families send it to Iraq, since equipment vendors are not allowed to send packages directly to the theater. But the Marines of 2/6, who regularly spent most of the day in their armor during training, wanted the Spartan 2 (MTV) so badly that some of them had their families send them to Iraq. Take note also that the IBA doesn’t have the side SAPI integrated into the vest, so it hangs onto the IBA with Molle straps. In fact, this particular Marine has his side SAPI hanging a full five or six inches below the rest of his vest (in the early days of the Anbar campaign, this gap under his arms was a favorite target for snipers, whereas the MTV solves this problem). When this Marine was at Camp Lejeune, he didn’t have the side SAPIs hung onto the vest with Molle straps. In fact, he didn’t have them at all. Again, these SAPIs are issued upon entry to Iraq, and those side SAPI plates add quite a few pounds to the system. Notice also that the rear SAPI is hiked up a bit in the back well above the lower part of his spine. This is the way the IBA holds the SAPI plates. Down in the front, high in the back, and side SAPIs hanging on by Molle, sagging down and exposing their ribs and lungs. The IBA and the MTV are merely tactical outer vests to hold the soft panels (to protect against very small arms fire or shrapnel) and SAPI plates (to protect against up to a 7.62 mm round). The body armor itself – front SAPI, rear SAPI, soft panels and side SAPIs – are exactly the same between the two body armor systems. This point is critical to understanding the current dust-up. Again, the weight between the two is the same. The MTV does not weigh more than the IBA. The MTV and IBA are vests, not armor. There are a few changes made to the MTV that make it different than the IBA. First, the front SAPI is raised a little and the rear SAPI is lowered a little to provide protection to the spine. Second, a neck guard is provided for shrapnel, and third, a soft panel groin protector is provided. The neck and groin protectors add little to the weight of the vest – no more than a pound or so. Fourth, the MTV fully integrates the side SAPIs into the vest rather than hanging them onto the vest. Finally, the MTV hugs the torso and places the weight on the hips, much like an internal frame backpack, as opposed to the IBA which places all of the weight on the shoulders. I have completely, absolutely, positively no idea whatsoever what this article is talking about. It makes absolutely no sense at all to me. The MTV is a carrier, not a new set of body armor. All of the weighty elements from the IBA – the front ESAPI plate, the rear ESAPI plate, and the side SAPIs, along with the soft panels placed inside the carrier – are still there with the MTV. More precisely, the soft panels are taken out of the IBA along with the SAPI plates and placed in the new carrier. The soft panels had been inefficiently deployed in the shoulder area in the IBA, and now are fully utilized. One big difference in the MTV and the IBA is the fact that the IBA hung completely on the shoulders, and allowed no load bearing whatsoever on other parts of the body. The MTV hugs the torso, especially at the hips, and places the weight on the hips somewhat like an internal frame backpack. This feature was so popular among the grunts with my son’s unit before they deployed to Iraq in 2007 (which happened to be prior to the point that the MTV had been issued) that most of the men went to TAGs (Tactical Applications Group) just outside Camp Lejeune and purchased the commercial version of the MTV, or the Spartan 2. I have heard multiple Marines myself praise the MTV for its ability to take the load off of the shoulders and place it on the hips – and thus PREVENT BACK PROBLEMS, and have never once heard even the slightest complaint. I have also worn the IBA and Spartan 2, and know the difference first hand. I simply cannot account for the report in this article. The only possible explanation I have for it is that the complaints may not be coming from grunts who have to go on 20 mile “humps” with their armor on (along with ammunition, Camelback, carabineer to hold weapon, etc.). The MTV (or Spartan 2) was so popular among Marines at Camp Lejeune that, again, personal funds were spent purchasing it. Compare this to the IBA which places the load on the shoulders, and again, I simply do not understand this article. Also, the IBA hangs the side SAPIs by Molle loops, so usually they sag (making good sniper targets under the arms of the wearer because of this sagging). The only real weight difference with the Spartan 2 / MTV and the IBA that I have seen is the existence of the front groin soft panel guard. This adds what – several ounces of weight? Again, confused, and suspect there is more to this story than meets the eye. As it turns out after reading the discussion thread on this post, I was right, and the Marines are complaining about the weight of the armor and not the design of the vest. In other words, this is what is happening. Marines who are not infantry have trained with their vests on less frequently and not as long in duration as Marines who are infantry, and when they do have them on, they only have the front and rear SAPI plates inserted. The Marines of 2/6 trained with only their front and rear SAPI plates as well, but knew that they would receive side SAPIs upon deployment to Iraq because many of them were “salty” Marines; they had done this before, some more than once. Marines who are complaining of heavier weight haven’t been properly briefed or trained to expect heavier loads due to the side SAPIs whether they wear the IBA or MTV. So the complaints flow concerning weight, as if the weight is all about the MTV versus the IBA rather than the four SAPI plates themselves. Just to make sure about this, I recently conversed with a senior Marine in whom I place the greatest confidence. Here is what he told me. Yes, the battle space weight is significant, with the armor, the hydration system, ammunition, firearm, radios and other equipment. The debate is about the use of side SAPI plates, not the MTV or the IBA. It had been previously considered to jettison the requirement to wear side SAPIs based on conditions in theater, but this is a situation-specific decision. Weight must be reduced in order to save the health of our warriors, and this should be a goal of future warrior systems. The MTV is a vest, not armor, and thus has nothing whatsoever to do with the debate about weight. The MTV was an outstanding success, my Marine contact tells me. The USMC should be proud of the equipment they have designed for armor. It is the best available anywhere. I want to be an embedded journalist! It no longer makes economic sense for many news agencies to keep people here. Those who do stay operate at a loss. If making a profit is important, reporting from Iraq is a bad business decision. This seems to be holding for the new or alternative media as well. I haven’t seen a blogger in maybe a year, though I know that some, like Michael Totten and Matt Sanchez, have spent a good deal of time embedded with the troops. Matt Sanchez seems to have more staying power than most; he says he’s spent eight months here. The best reporting comes from reporters who have spent the most time on the ground here, because the context is complex and evolving. Long distance reporting is like exploring the moon through a telescope. To get a feel for the ground here, a journalist has to be like Captain Kirk. I have often commented on how very different the reality is over here from what most Americans seem to think it is. There is no way to explain how different, except to say “you would have to be here to understand it.” When mainstream reporters get the story wrong, it’s usually because they lack the context and depth of experience necessary to correctly interpret what they see and hear. The same is true for bloggers, some of whom are grandiose in implying that they spend a significant amount of time in the field, but an inventory and audit would not support the claims. The mainstream media continues to carry the overwhelming bulk of the load. On the other hand, bloggers like Bob Owens, Blackfive, Glenn Reynolds and Michelle Malkin, have served as important media watchdogs, without whom shoddy coverage of the war likely never would have been revealed. Hopefully they will continue to apply spotlights to keep as much accurate and quality reporting as possible, regardless of whether it comes from mainstream or alternative sources. In Mosul this week, at least five other writers and two photographers were here, from such organizations as The Washington Post, New York Times, The Telegraph and Agence France-Presse. All seven are veteran international reporters, and most have substantial experience covering wars. I have never been in a group of journalists in Iraq where all of us had so much war experience. The A-team is definitely here. Yet by the time of the American presidential election, the Iraq news stream likely will have diminished to almost nothing, precisely when events over here will demand the most skilled and experienced reporters. That is when, bets are on, many of the bloggers will again trumpet Iraq-experience they do not possess. Fact is, for battlefield reporting, mainstream media retains a virtual monopoly, and the bloggers are not in a position to compete, or at least are utterly failing to compete on teh (sic) most important battle ground: the ground. These harsh truths come as plea to bloggers to get over here and walk the walk. Alternative voices are needed. Stop talking. Start walking. Michael Totten agreed with Yon in his post at Instapundit. On February 24, 2008, Pete Hegseth writing at National Review Online also lamented the current paucity of reporters traveling to Iraq. A little of my history is in order at this point. I began blogging as an honor to my son in the Marines. As I learned more and shared his experiences – if only in words, reading and visits – I grew in my blogging efficiency and experience. Before long, it was time for my son to deploy to Iraq. He and his unit left in April of 2007, deploying to FOB Reaper in Fallujah in support of Operation Alljah. As a side note, the interview with Lt. Col. William F. Mullen (now Colonel Mullen) had to get me by (along with some good embedded reporting by Bill Ardolino). As I told Colonel Mullen (only partially joking), I would have given my right testicle to be there in Fallujah with my son, but I couldn’t find a buyer for my right testicle. But I am getting ahead of myself. I had talked a good bit with Michael Fumento about the cost and difficulty of embedding, and I knew that it was almost always a money-losing proposition. But I thought I had it worked out. David Danelo (who is a great journalist and writer, combat experienced warrior, and all around good guy) and I had been discussing the possibility of sending me to Iraq to meet my son. At this time David was with U.S. Cavalry On Point. By the time I had gotten my things about in order to go, I found out that David had left U.S. Cavalry to pursue other things (and I feel sure that we will benefit in the future from his work). For reasons that I don’t now know and probably never will, the funding dried up and I was left without a way to Iraq. But let’s be more precise; it’s more than just “a way to Iraq.” The costs are huge. I knew about the body armor, the photographic equipment, the laptop, the satellite uplink equipment some bloggers use, the airplane fare, the wasted time in airports and through customs, the hotel fees prior to entry to Iraq, etc. But until I had thought about it, it didn’t occur to me that the biggest expense for a blogger is the loss of his salary. Danelo had a soft agreement with me to pay me for stories to match the loss of my salary. But in order to embed for any length of time (say a month or two), this cost becomes exorbitant. After Michael Totten linked Yon and weighed in that he also would like to see more bloggers embed, I conversed with Michael Totten by e-mail. Michael’s advice was stark. It is always a money-losing proposition. He tells me that Bill Ardolino takes vacation time in order to keep costs down, but of course, this is a good option only insofar as you are certain that you won’t need it later for home repair, dependent care time, or other needful life exigencies. Michael Yon operates on a shoestring budget, Michael Totten always loses money even though he sells his stories to main stream media outlets, Bill Ardolino takes vacation time, Michael Fumento always loses his own money, and so on the list goes. And these journalists get thousands of visits per day to their site (and have built a loyal following from which to draw funds), while I get a pitiful 300 – 400 visits per day. Further, the number of actual committed readers who would be willing to contribute is unknown, but is probably far less than 400. Please note that I’m not complaining. I’m simply drawing out the facts of the matter. It sounds nice to encourage (even goad) bloggers into embedding with the troops. If it were not for the fact that I have studied this a bit, I might even feel somewhat guilty for not being there in order to report on the facts. But Michael Yon said it as well as anyone while in the middle of this encouragement to go: “those who do stay operate at a loss.” It has nothing whatsoever to do with profit. It has entirely to do with losses. For now the alternative (or new) media is just that. Main stream media has the money and we don’t. Insofar as this condition continues, we will continue to have a symbiotic relationship with the main stream media, and they will get the lion’s share of the embeds. Plain and simple, it’s just the dollars and sense of the issue. Today we have yet another indication of Iran’s actions in Iraq, given to us straight from someone who would know. Iranian secret service agents are working to “sabotage” the operations of groups fighting Al-Qaeda in Iraq, Baghdad’s intelligence chief said on Wednesday. Mohammed Abdullah Shahwani issued the statement shortly before a landmark visit to Baghdad on Sunday by Iranian President Mahmoud Ahmadinejad. “We have information confirming that Iranian secret services have sent agents to sabotage the Sahwa experience in Iraq,” the statement said, referring to mostly Sunni groups fighting Al-Qaeda in Iraq alongside the US military. Vigilant indeed. They should kill the Iranian usurpers. Another example is given to us in the Pakistan / Afghanistan region, but this example is not of a formal nation-state actor (although it is being allowed to exist by a nation-state). Al Qaeda is taking a greater role in coordinating the Taliban and other Islamist militant groups operating in Afghanistan’s volatile border region with Pakistan, a top U.S. commander said yesterday. U.S. military officials are concerned the activity is part of an ongoing effort to escalate violence in Afghanistan against U.S.-led NATO forces as attacks in Iraq subside. Similar to Vietnam where the Viet Cong were supported by North Vietnam who was supported by Russia and China, this is the brave new world of transnational movements that David Galula didn’t get to experience. Dutch troops deploying to Afghanistan last fall had a surprise awaiting them. TARIN KOT, Afghanistan — Lt. Col. Wilfred Rietdijk, a 6-foot-7 blond Dutchman, took command of his military’s reconstruction team in the southern Afghan district of Deh Rawood in September. Tranquil and welcoming, it seemed like the perfect place for the Netherlands’ mission to help rebuild this country. Intelligence reports indicated that the district was free of the Taliban, allowing the soldiers greater freedom of movement than elsewhere in Uruzgan province. “We could go out on foot,” Rietdijk said. Reconstruction teams, escorted by a platoon of soldiers, fanned across the fertile countryside, building bridges over streams and canals, repairing irrigation systems, and distributing books and pens to local schools. As Hogeveen was settling into his armor-plated metal bunker at the main Dutch base, Camp Holland, near the provincial capital of Tarin Kot, Taliban fighters were evicting local police from three of Deh Rawood’s most strategic checkpoints. They bribed officers to abandon one post, kidnapped the son of a policeman at a second checkpoint and attacked the third, sending officers fleeing. They turned a local school into their headquarters and stocked it with weapons and ammunition, Hogeveen said he learned later. Then they lay in wait and ambushed the first unsuspecting Dutch convoy they spotted. “They were better prepared than anyone led us to believe,” Hogeveen said. Hogeveen’s troops and the Taliban skirmished almost daily. In mid-December, fighters yanked a 60-year-old woman and her 7-year-old grandson off a bus in Deh Rawood. They interrogated the pair and, after finding a U.S. dollar bill in the boy’s pocket, accused the two of spying and executed them in front of the other passengers and bystanders, according to accounts by Afghan human rights groups, news services and Dutch officers. Meanwhile, on the advice of U.S. and Dutch intelligence officers, Hogeveen prepared a battle plan for routing the Taliban: “The intelligence guys said, ‘If you go in with large forces, they will leave,’ ” Hogeveen recalled in an interview. He sent larger contingents of heavily armored troops into the heart of the Taliban stronghold in northern Deh Rawood, a jumble of mud houses connected by mazes of narrow lanes. Today, after 2 1/2 months of often intense combat, Dutch troops have reclaimed some of the villages of Deh Rawood and are helping villagers repair the damage caused by weeks of fighting between NATO forces and the Taliban. They have also started many new projects and are working more closely with tribal leaders, the Afghan army and local police to provide better security for the residents. Even so, the Dutch say, the Taliban forces have merely relocated to the fringes of the district, and thousands of villagers remain too frightened to return to their homes. The resilience of the Taliban, a shortage of NATO forces and the Dutch philosophy that the Afghan people need to take charge of their own lives have prompted the Dutch to adopt a precarious strategy for Uruzgan: evict the Taliban from small enclaves while ceding the surrounding territory to them in hopes that neighboring communities will oust them on their own. David Galula’s ideas – a man who is a virtual unknown in his country of origin, and who is the doctrinal father of the counterinsurgency manual FM 3-24 – are being implemented in Afghanistan. Galula advocated targeted action in select areas, with resources moved as needed. I have long advocated seeing Galula’s ideas as useful and helpful, but within their proper context. But his campaign in Algeria was far different than the war on terror we fight today, on a least (but not limited to) the following fronts. The global insurgency characteristic of the campaigns in Iraq, Afghanistan, Pakistan, North Africa and Chechnya and other places, thrives on a transnational ideological movement. Whether response to globalization or for religious motivation (I advocate the later), borders mean nothing to international jihadists. David Galula fought a campaign in Algeria; today the U.S. fights a campaign around the world with immediate flow and communication of personnel, ideas, intelligence and weapons. Modern technology has introduced standoff weapons to the battle space such as IEDs. This becomes a force multiplier for the insurgency. Religious ideology has brought terror and suicide (or martyrdom) missions into the battle space. Hence, rather than vying for good governance and protection of the population, the insurgency uses brutality and torture as weapons of intimidation, preventing the need to take the subsequent steps of a typical 1960’s style insurgency of providing state-like functions and services. Popular sentiment at home among the public will prevent the U.S. military from ever again having ten to twelve years to conduct a counterinsurgency campaign. For a COIN campaign to last this long would require the support of three consecutive presidential administrations, obviously an exigency which stands almost no chance of coming to pass. In addition to an insurgency being a function of counter-forces within a nation state, they can be (and have been in the case of Iran) funded, supported and trained by nation states to undermine the stability of the host country. There are many more reasons that I have detailed in past articles, but these five will suffice. Again, Galula’s ideas are worth studying (and implementing in certain circumstances), but inadequate to form the basis for a comprehensive COIN doctrine. The “whack-a-mole” brand of counterinsurgency didn’t work in Iraq, and will not work in Afghanistan. For COIN operations to succeed, two elements must be present as we have learned in Iraq. First, the force size must be right. If there aren’t enough troops to take, hold and rebuild, the campaign will fail in the brave new world of the global religious insurgency. Second, having the right force size in itself does nothing to ensure the proper use of those troops. The corollary or companion axiom for force size is force projection. The circumstances on the ground, with the population being too afraid to return to their homes due to terror, and the loss of years of effort at becoming trusted for good governance, proves the contrary of the Dutch strategy. Pushing the insurgency into surrounding areas doesn’t work, either short term or long term. The Dutch contingency represents the wrong strategy, while U.S. forces have recently been documented doing the right thing with too few troops in a stunning New York Times Magazine article. OVER THE LAST two years, the Americans have steadily increased their presence in Kunar province, fanning out to the small platoon-size outposts that have become the signature of the new counterinsurgency doctrine in both Afghanistan and Iraq. The Korengal Outpost, nicknamed the KOP, was built in April 2006 on the site of a former timber mill and motel. The soldiers of Battle Company of the 173rd Airborne Brigade Combat Team live there in dusty tents and little wooden huts. They now have hot food and a small chow tent with an Internet linkup and a few phones for calling home. But the place was protected by not much more than concertina wire and sentries. Nearly every time I arrived at the KOP our helicopter was greeted by sniper fire or the dushka — a Russian-made antiaircraft gun. But as hard as Iraq was, he said, nothing was as tough as the Korengal. Unlike in Iraq, where the captains and lieutenants could let down their guard in a relatively safe, fortified operating base, swapping stories and ideas, here they had no one to talk to and were almost as vulnerable to enemy fire inside the wire as out. Last summer, insurgents stormed one of the bases in a nearby valley and wounded 16. This admission from Kearney – who is undoubtedly a good officer – is telling. The Anbar province saw combat outposts, distributed operations, countersnipers, and higher casualties well before the balance of Iraq. It is fair to say that the surge and security plan was in part modeled after the Anbar campaign. But while Marines (and some Army and National Guard) in Anbar were taking casualties, some forces in Iraq were well protected in safe FOBs. The reason, in other words, that Kearney saw Afghanistan as far different from Iraq is because he was not deployed in the Anbar province. It isn’t too long ago that Marines were dying by the score from sniper rounds and room clearing in Anbar. But Kearney is certainly seeing his share of kinetic operations now. ON OCT. 19, Kearney and Battle Company were air assaulted into the insurgents’ backyard for a mission that many thought insane. It was called Rock Avalanche and would last about six days. One of its main targets was the village of Yaka China. Kearney, being the good soldier, tried to pump up his boys with the promise that they would be going after insurgents who had killed their friends and whose grizzled faces were plastered on their bad-guy family-tree wall at the KOP. They would upset the guerrillas’ safe haven and their transit routes from Pakistan. They would persuade the villagers to stop harboring the bad guys by offering an $11 million road project that had just been approved by NATO and Kabul and would be built by the Kunar Provincial Reconstruction Team. And they’d complete the “human terrain mapping” that is part of the new counterinsurgency doctrine — what families dominate, who’s married, who’s feuding, are there divisions to be exploited? It was a lot to ask of young soldiers: play killer, cultural anthropologist, hearts-and-minds winner and then killer again. Which is why, just hours before the mission was to begin, some soldiers were smearing black-and-green war paint on their faces when their sergeant shouted: “Take it off. Now!” Why? They’d frighten the villagers. It seemed a moot point as Rock Avalanche got under way. Apache gunships were scanning the ridges for insurgents. Other helicopters were dropping off more soldiers. An unmanned drone was whining overhead as it sent infrared video feeds to a large screen back at the battalion’s headquarters, Camp Blessing, six miles north of the KOP. “They’re right down there!” said Kevin Caroon as he gazed out of his night vision. Caroon, from Connecticut and a father of two, was an Air Force JTAC — the joint terminal attack controller who talks the combat pilots onto their targets. “See that? Two people moving south 400 meters away from us,” Caroon said, pointing down the mountain face. More insurgents were located nearby. “Sir, what do you want to do?” Caroon asked Kearney. “I want them dead,” Kearney said. Caroon radioed the pilot his instructions, “On-scene commander’s intent is to engage.” And that was it. A sudden wail pierced the night sky. It was Slasher, an AC-130 gunship, firing bullets the size of Coke bottles. Flaming shapes ricocheted all around the village. Kearney was in overdrive. The soldiers back at the KOP were radioing in that the drone was tracking 10 men near the tree line. Yarnell was picking up insurgent radio traffic. “They’re talking about getting ready to hit us,” someone said. The pilot could see five men, one entering a house, then, no, some were in the trees, some inside, and then, multiple houses. He wanted confirmation — were all these targets hostile? Did Kearney have any collateral-damage concerns? Cursing, Kearney told them to engage the men outside but not to hit the house. The pilots radioed back that men had just run inside. No doubt there would be a family. Caroon reminded Kearney that Slasher had only enough fuel to stay in position for 10 more minutes. “What do you want to do, sir?” Caroon asked him. Flaming rockets flashed through the sky. Thunder rumbled and echoed through the valley. Then there was a pause. Slasher asked Caroon whether the insurgents were still talking. Kearney shouted over to Yarnell in his ditch, “You picking anything up?” Nothing. More spitting rockets. In the logic of war, the best antidote for the menacing ghostliness of the ambushing enemy is killing and knowing you’ve killed them. The soldiers in the Korengal almost never had that kind of satisfaction. Any insurgents, if they were killed, would be buried fast, and all that was left in their wake were wounded civilians. That morning, after a long night of fighting, was no different. Within an hour or so, Lt. Matt Piosa, an earnest, 24-year-old West Point grad, and his patrol were in Yaka China. They radioed that the village elders were asking to bury their dead. They’d also collected wounded civilians. The tally was bad — 5 killed and 11 wounded, all of them women, girls and boys. Human terrain mapping, anthropologists, provincial reconstruction teams, and all of the things that make classical COIN advocates happy. The next installment should be theme parks for the kiddies. But this dissipates in the face of kinetic operations that need more troops. The pretext to successful reconstruction, I have discussed before, is force projection and security. To be clear about the civilian casualties, it occurs to me that the journalist with the NYT Magazine doesn’t understand the nature of war. Her clinical perceptions hopefully didn’t survive several weeks in Afghanistan. I have clearly advocated ROE that holds first in importance the protection of U.S. forces rather than the implementation of international law. All other things take secondary or even tertiary importance. I am not concerned about neither ROE problems nor the potential loss of noncombatant support for the campaign in this specific instance. However, the concern appropriate to this incident is the use of air power and what role it plays. I have also advocated air power in COIN, but for the purpose of protecting U.S. forces and providing acceleration to the campaign. I do not advocate air power as a replacement for ground forces. Air power should be used as a force multiplier, not force replacement. Captain Kearney knows how to conduct kinetic operations and work the population. Captain Kearney doesn’t have enough troops. With the narcotic influence of classical COIN doctrine which claims that we have ten to twelve years, and in which it is acceptable to push the insurgency to different locations rather than kill or capture them, the strategic malaise in the Afghanistan campaign continues unabated. The campaign needs more forces, more force projection, and strong leadership. This kind of campaign belongs to regular, active duty Army and Marine infantry, not air power (which is simply a force multiplier) or state-side COIN specialists – and certainly not NATO intransigence. Captain Kearney and his men need reinforcements, and NATO command is holed in FOBs wondering what their public back home thinks. A spokesman for the Taliban has now officially weighed in on relations with the new political parties in power in Pakistan. Pakistan’s Taliban fighters have threatened to step up their bloody campaign against the country’s security forces unless the new government abandons its support for the US-led war on terror. On Sunday, the group welcomed the victory of opposition parties in last week’s election and called on them to drop the pro-American policies of President Pervez Musharraf, a key US ally. “We want peace, but if they impose war on us, we will not spare them,” said Maulvi Omer, a spokesman for Tehrik-e-Taliban. In another worrying sign for Washington, the PPP has called for an end to military operations against insurgents in Baluchistan, a southwestern province where the Afghan government believes the leadership of the Afghan Taliban may be hiding. But as part of the same communication, the Taliban issued their threats, they offered peace talks. Maulvi Umar, spokesman for the Islamic militant Tehrik-e-Taliban, said his group welcomed the victory of anti-Musharraf parties and was anxious to talk with them about ways to bring peace to northwestern tribal areas, where U.S. officials believe Osama bin Laden himself may be hiding. Deebow at Blackfive believes that this means incursions across the Pakistani border to chase insurgents. Sadly, I disagree. NATO lacks strategic vision in the Afghanistan campaign, leading us in part to the situation in which we find ourselves. The campaign has focused on transition teams, training Afghan troops, force protection, road construction, and every conceivable thing other than offensive operations against the Taliban. This isn’t to deny that there are brave troops in theater who have fought and won battles. It is to assert, though, that had they been allowed to do this unimpeded, the campaign would be far better for it. As for Pakistan, talking with the Taliban is what led them to this point. My prediction is that there will be more of the same and a continuing resurgence of the Taliban both in Pakistan and Afghanistan, unless 3200 Marines are allowed to hunt and kill the enemy. Pakistan President Musharraf is considering stepping down (h/t Jules Crittenden). Musharraf is important, but there is a more important undercurrent within Pakistani politics at the moment. M K Bhadrakumar with Asia Times gives us a glimpse into the inner workings of the Pakistani mind. A far more worrisome development for Washington should be the capture of power in the North-West Frontier Province (NWFP) by the Awami National Party (ANP). Foreign observers are yet to size up the profound implications of an ANP government, which espouses Pashtun nationalism, in the sensitive province bordering Afghanistan. The ANP’s electoral success over the Islamic parties is being commonly seen as signifying a rout of the forces of extremism and as the victory of the secularist platform. While this is manifestly so, what cannot be overlooked at the same time is that the ANP also has a long tradition of left-wing politics and consistent opposition to US “imperialism”. Significantly, in the present party line-up, ANP expresses its closest affinity with PML-N – and not PPP to which it ought to be ideologically closer. Without doubt, ANP has opposed the US’s support of Israel, the US invasion of Iraq and the Bush administration’s intimidation of Iran. It has vehemently criticized Washington’s policies allegedly aimed at establishing US hegemony. It has condemned the US forces’ operations in the Pashtun regions in southern Afghanistan during the “war on terror”. On Wednesday, the ANP leadership reiterated its demand for “peaceful means to end militancy in the [NWFP] province and the adjacent tribal areas”. In practical terms, an ANP government in power in Peshawar will find it impossible to lend support to the sort of military operations that the US would expect the Pakistani military to undertake in the border regions with Afghanistan for ending “militant activities”. Interestingly, ANP makes a clear careful distinction between “militancy” and “terrorism”. To be sure, the ANP will point out that the US is pursuing its own national interests in Afghanistan and is expecting Pakistan to kill the Pashtun militants so as to save American lives. The ANP will also demand that Pashtun alienation in Afghanistan and in the tribal areas must be addressed through dialogue and political accommodation as well as through a long-term policy of economic development of the region. The noisy election has been largely portrayed as a referendum on Musharraf’s controversial rule, whereas the specter that is haunting Washington is the widespread opposition to the “war on terror” in Pakistan. This opposition cuts across provinces, ethnic and religious groups or social classes in both rural and urban areas. The US’s perceived hostility toward the Muslim people is at the root of this anti-Americanism, and it will not easily fade away. Bhadrakumar gives us reason to believe that the party that has been placed in power cannot accommodate the U.S. war on terror. This is significant, and points to even deeper undercurrents within Pakistani politics, this undercurrent being tantamount to a Pashtun rejection of the war on terror. It is good that the Pentagon is looking for other ways to supply NATO forces in land-locked Afghanistan if Pakistan becomes even more inhospitable to U.S. forces. There are indications that planned “aggressive” evolutions against enemy targets in Pakistan may now have to be put on hold (or cancelled outright). American officials reached a quiet understanding with Pakistan’s leader last month to intensify secret strikes against suspected terrorists by pilotless aircraft launched in Pakistan, senior officials in both governments say. But the prospect of changes in Pakistan’s government has the Bush administration worried that the new operations could be curtailed. Among other things, the new arrangements allowed an increase in the number and scope of patrols and strikes by armed Predator surveillance aircraft launched from a secret base in Pakistan — a far more aggressive strategy to attack Al Qaeda and the Taliban than had existed before. But since opposition parties emerged victorious from the parliamentary election early this week, American officials are worried that the new, more permissive arrangement could be choked off in its infancy. In the weeks before Monday’s election, a series of meetings among President Bush’s national security advisers resulted in a significant relaxation of the rules under which American forces could aim attacks at suspected Qaeda and Taliban fighters in the tribal areas near Pakistan’s border with Afghanistan. The new, looser rules of engagement may have their biggest impact at a secret Central Intelligence Agency base in Pakistan whose existence was described by American and Pakistani officials who had previously kept it secret to avoid embarrassing President Pervez Musharraf politically. Mr. Musharraf, whose party lost in this week’s election by margins that surprised American officials, has been accused by political rivals of being too close to the United States. Meanwhile, more forces are being deployed to Afghanistan to “train” Afghani troops, and we cannot but conclude that the conventional operations which too soon stood down to “peace-keeping operations” (rather than COIN operations), are now turning into a complete turnover to the Afghan forces. Part of the problem is the fact that NATO, which has absolutely no strategic plan for Afghanistan, is at the helm of the campaign thanks to the efforts of Donald Rumsfeld. But while training indigenous troops to bear the load in Afghanistan is a positive step forward, the Taliban are enemies of state in Afghanistan only so long as they don’t hold power. The Taliban are now and always will be enemies of America, and the human terrain in both Pakistan and Afghanistan is becoming complicated to say the least. Time is of the essence, and the well-worn dictum that counterinsurgency takes ten years (based on David Galula’s experience, fighting different people under different circumstances who held different beliefs) will only serve as soothing and narcotic words to an addicted military brass as the campaign “goes South.” The campaign, that is, that is both Pakistan and Afghanistan at the same time. 2nd Infantry Division Deploys to Iraq – No, Not Really! GI Korea at ROK Drop writes to tell us of the “delays” in redeployment of 2ID in Korea. Drop by and read his post until it makes you rather sick. Financing problems? The Korean government has enough money to build a canal across the country and ship over a billion dollars a year to North Korea, but they don’t have enough money to move soldiers from 2ID to Camp Humphreys until 2015? The prior agreed upon 2013 deadline was just a little over a year ago agreed upon to be pushed back fours years from the earlier agreed upon 2009 timeframe. Which by the way was a unilaterally decided on delay by the Korean government which quickly pounced on the opportunity to cut funding and renege on the deal when the prior US Defense Secretary Donald Rumsfeld resigned. This delay is also being done in coordination with delay efforts to stop the hand over of war time operational control from the US military to the Korean military. Does anyone also think it is a coincidence that United States Forces Korea (USFK) commander General B.B. Bell was forced to retire because of his advocacy for maintaining the relocation plan along with the transfer of operation control? The Korean government has long been at odds with General Bell and now with him out of the way they are free to begin their delay games with the USFK relocation plan. Even more suspicious is the timing of this announcement. This announcement was released by the Korean government’s official news agency Yonhap, late on a Sunday right before new Korean president Lee Myung-bak’s big inauguration ceremony on Monday so the local papers will hardly pick up on the 2ID delay story. This is just more evidence that despite all the Yankee Go Home rhetoric in South Korea the truth of the matter is as the by line of this blog states, is to keep the USFK gravy train rolling along in Korea. The Korean government has never wanted to allow the USFK relocation to Camp Humphreys just like they have never really wanted to take operational control from USFK either. The redeployment plan was never bold enough. If Rumsfeld (and now Gates) couldn’t be mean enough, they can turn the decision over to me; I have no problems with meanness. Here is my plan. 2ID deploys to Iraq – where there is actually a counterinsurgency campaign going on as we speak – and this redeployment happens as fast as the aircraft can fly. Ah, the logistics officers object! But you have no FOB or combat outposts into which they can deploy! You aren’t ready for them. Well, the surge can be extended by deployment of the 2ID, and troops who have been in Iraq for 15 months can come home. The FOBs and COPs they leave can be used by 2ID. Or, the 2ID can pitch tents and provide force protection for a while. After all, they are infantry, aren’t they? Again the logistics officers object, “you just want the 2ID in theater as fast as possible to get them into the fight!” Yes, I have been found out. After redeployment of 2ID into an actual fight, South Korea can ponder whether they wish to continue their ridiculous “sunshine diplomacy” with North Korea. Then, our international welfare to South Korea (who is completely capable of defending herself) can come to an end, and we can take the global war on terror seriously. I trust you probably know this, but 2ID is already in the rotation for Iraq. Their 3rd BCT was in Baghdad last summer; 4th Stryker BCT is here now; and 5th(!) BCT is training to come. Their HQ unit is in Korea, and some of their combat forces are always in Korea when they aren’t in Iraq, but 2ID is taking their fair turn out here. Response: Yes, I know. They are good troopers, and for that reason I just want to get them all into the fight and out of Korea where they are not contributing. Call me romantic. Every now and again it helps to sit for a minute to ponder and reflect. 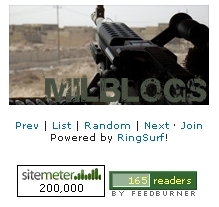 The Captain’s Journal turns a page with 200,000 visits. The picture below shows the reach of the Captain’s Journal on a typical day. 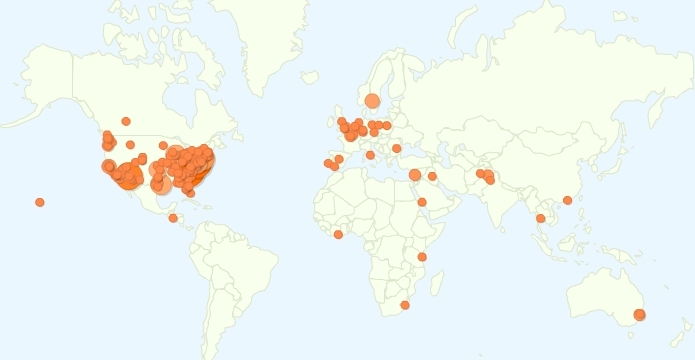 This Google Analytics map was from February 22, 2008, with 428 visits. The reach extends from Rawalpindi (the home of the Pakistan Army Headquarters), to Lahore, Kabul, Sydney, Baghdad, Beirut, Cairo, New York, Chicago, Houston, Los Angeles, Austin, Alexandria, the Pentagon, the U.S. Air Force Academy, the U.S. Military Academy at West Point, Camp Lejeune, Fort Bragg, Kirtland AFB, Charleston AFB, F.E. Warren AFB, and so on. My friend and fellow Marine father Michael Ledeen told me once that “the goal of writing is to change someone’s mind, we know not whom.” Indeed, I know not whom, but I suppose that I’ll keep writing since I haven’t caused any harm yet. I thank all of my readers, not just the high profile military visits. Main stream media reports almost across the board are gushing at the rejection of Islamism that allegedly dominated the recent Pakistani elections. There are too many such reports to enumerate here, but one extreme example will suffice from McClatchy. Pakistani voters have handed Islamist political parties a massive defeat, virtually eliminating them from regional parliaments. The election Monday is likely to have a wide-ranging effect on efforts to rein in growing Taliban and al-Qaida influence in Pakistan’s North West Frontier province. In 2002, fundamentalist religious parties, some openly sympathetic to the Taliban, won 12 percent of the national vote. That was enough to form a regional government in the province that borders Afghanistan. It also allowed the parties to become part of the ruling coalition in Baluchistan, another province, and to hold 57 seats in the 342-member national Parliament. But unofficial results of Monday’s vote indicate that religious parties won only five seats in the national Parliament. In North West Frontier province, where the country’s Islamic insurgency is strongest, religious parties won just nine seats in the 96-seat provincial assembly. In 2002, they won 67. This is strong analysis – “sea change,” and “massive defeat.” Yet this doesn’t even qualify as good surface level cursory analysis. In order to understand what the Pakistani voters rejected and what they didn’t, it is important to go backwards in time to understand what is being called the “next generation Taliban” by the smarter analysts. For this we must turn to Nicholas Schmidle. His most extensive commentary and analysis from his time spent in Pakistan is entitled Next-Gen Taliban in the New York Times Magazine (a small portion of this important analysis is included below). The next generation Taliban, unlike their predecessors in the tribal region who also want total Islamism in Pakistan and Afghanistan, completely reject democratic means to accomplish such change. They are also more savvy technically and have no theological baggage regarding reluctance to suicide missions. The Taliban in Afghanistan are learning from the jihadists across the globe who have travelled to Pakistan to fight, and suicide missions in Afghanistan are increasing, and increasingly carried out by Afghanis themselves. More recently, Schmidle weighed in on what the vote from the North-West Frontier Province means. Does this mean the end of Islamism in Pakistan? Not quite. In fact, while the defeat of Musharraf’s political allies in the PML (Q) signals a new political leadership in Islamabad, the defeat of the MMA could also signal a new political and religious leadership in the troubled areas along the border with Afghanistan. In the North West Frontier Province, where the MMA formed the provincial government last term, the Islamists’ vote bank was a combination of die-hards who desired the creation of an Islamic state and those less ideologically driven who were attracted to the MMA’s promises of justice, economic renewal, and security. This time around, the latter voted for the Awami National Party. The former, such as Iqbal Khan of the Swat Valley, joined the Taliban. Note well Schmidle’s analysis. The less ideologically driven voter abandoned the Islamist party, but then, he never voted for that party for the purposes of institution of sharia law anyway. He voted for jobs, sewers, electricity, water supply and good governance several years ago and got none of what he voted for. Hence, he overthrew the clerics this time around. The die-hards joined the Taliban. There are various colors and stripes of jihadists the world over, from Salafism to Wahhabism, from the purist Sunni radicals in Saudi Arabia to the Shi’a Mullahs and their followers in Iran. But one common element among them all is the utter rejection of democracy. Democracy is deemed to be directly contrary to Islam, and the Taliban, al Qaeda and their sympathizers and advocates sat out the election. They had no stake in it. So what will be the likely outcome of the Pakistani elections? No military action against the Taliban, just more talk, based on sentiment expressed just prior to the election. Mardan candidates also believe a democratic, civilian government would have more legitimacy to negotiate with the Taleban than one led by a former general, like President Musharraf. That has yet to be proven, says Rahimullah Yusufzai, an expert on the Taleban. “I don’t think they have a strategy to deal with this,” he says. The situation is even more shaky than that. Combined U.S.-Pakistani operations were planned in the tribal region prior to the election and are now cancelled. Further, the U.S. finds herself in the position of needing Pakistan more than she needs the U.S. There are strategically difficult and tenuous times ahead for Pakistan-U.S.-Afghanistan relations. The existence and strength of the Taliban and al Qaeda and the future of the counterinsurgency campaign in Afghanistan hangs in the balance. Whatever the future holds, the Pakistani voters have not rejected Islamism. They have rejected lack of jobs and financial security because leaders of the Madrasah didn’t know what they were doing when they tried to govern a society. Islamism has nothing whatsoever to do with it. Making up fairy tales about what they meant when they cast their vote doesn’t help the counterinsurgency campaign in this troubled region of the world.